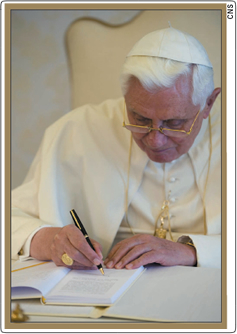 Excerpts from Pope Benedict XVI’s third encyclical. Charity is at the heart of the Church’s social doctrine. Every responsibility and every commitment spelt out by that doctrine is derived from charity which, according to the teaching of Jesus, is the synthesis of the entire Law (cf. Mt 22:36- 40). It gives real substance to the personal relationship with God and with neighbor; it is the principle not only of micro-relationships (with friends, with family members or within small groups) but also of macro-relationships (social, economic and political ones). For the Church, instructed by the Gospel, charity is everything because, as Saint John teaches (cf. 1 Jn 4:8, 16) and as I recalled in my first Encyclical Letter, “God is love” (Deus Caritas Est): everything has its origin in God’s love, everything is shaped by it, everything is directed towards it. Love is God’s greatest gift to humanity, it is his promise and our hope. I am aware of the ways in which charity has been and continues to be misconstrued and emptied of meaning, with the consequent risk of being misinterpreted, detached from ethical living and, in any event, undervalued. In the social, juridical, cultural, political and economic fields—the contexts, in other words, that are most exposed to this danger—it is easily dismissed as irrelevant for interpreting and giving direction to moral responsibility. Hence the need to link charity with truth not only in the sequence, pointed out by Saint Paul, of veritas in caritate (Eph 4:15), but also in the inverse and complementary sequence of caritas in veritate. Truth needs to be sought, found and expressed within the “economy” of charity, but charity in its turn needs to be understood, confirmed and practiced in the light of truth. In this way, not only do we do a service to charity enlightened by truth, but we also help give credibility to truth, demonstrating its persuasive and authenticating power in the practical setting of social living. This is a matter of no small account today, in a social and cultural context which relativizes truth, often paying little heed to it and showing increasing reluctance to acknowledge its existence. In 1967, when he issued the Encyclical Populorum Progressio, my venerable predecessor Pope Paul VI illuminated the great theme of the development of peoples with the splendor of truth and the gentle light of Christ’s charity. He taught that life in Christ is the first and principal factor of development and he entrusted us with the task of travelling the path of development with all our heart and all our intelligence, that is to say with the ardor of charity and the wisdom of truth. It is the primordial truth of God’s love, grace bestowed upon us, that opens our lives to gift and makes it possible to hope for a “development of the whole man and of all men”, to hope for progress “from less human conditions to those which are more human”, obtained by overcoming the difficulties that are inevitably encountered along the way…. A fresh reading of Populorum Progressio, more than forty years after its publication, invites us to remain faithful to its message of charity and truth, viewed within the overall context of Paul VI’s specific magisterium and, more generally, within the tradition of the Church’s social doctrine. Moreover, an evaluation is needed of the different terms in which the problem of development is presented today, as compared with forty years ago. The correct viewpoint, then, is that of the Tradition of the apostolic faith, a patrimony both ancient and new, outside of which Populorum Progressio would be a document without roots—and issues concerning development would be reduced to merely sociological data…. The link between Populorum Progressio and the Second Vatican Council does not mean that Paul VI’s social magisterium marked a break with that of previous Popes, because the Council constitutes a deeper exploration of this magisterium within the continuity of the Church’s life. In this sense, clarity is not served by certain abstract subdivisions of the Church’s social doctrine, which apply categories to Papal social teaching that are extraneous to it. It is not a case of two typologies of social doctrine, one pre-conciliar and one post-conciliar, differing from one another: on the contrary, there is a single teaching, consistent and at the same time ever new. 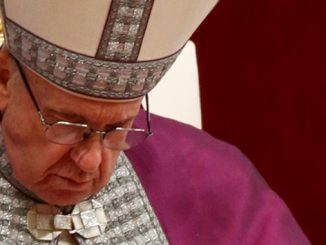 It is one thing to draw attention to the particular characteristics of one Encyclical or another, of the teaching of one Pope or another, but quite another to lose sight of the coherence of the overall doctrinal corpus. Coherence does not mean a closed system: on the contrary, it means dynamic faithfulness to a light received. The Church’s social doctrine illuminates with an unchanging light the new problems that are constantly emerging. This safeguards the permanent and historical character of the doctrinal “patrimony” which, with its specific characteristics, is part and parcel of the Church’s ever-living Tradition. Social doctrine is built on the foundation handed on by the Apostles to the Fathers of the Church, and then received and further explored by the great Christian doctors. This doctrine points definitively to the New Man, to the “last Adam [who] became a life-giving spirit” (1 Cor 15:45), the principle of the charity that “never ends” (1 Cor 13:8). It is attested by the saints and by those who gave their lives for Christ our Savior in the field of justice and peace. It is an expression of the prophetic task of the Supreme Pontiffs to give apostolic guidance to the Church of Christ and to discern the new demands of evangelization. For these reasons, Populorum Progressio, situated within the great current of Tradition, can still speak to us today. God is the guarantor of man’s true development, inasmuch as, having created him in his image, he also establishes the transcendent dignity of men and women and feeds their innate yearning to “be more”. Man is not a lost atom in a random universe: he is God’s creature, whom God chose to endow with an immortal soul and whom he has always loved. If man were merely the fruit of either chance or necessity, or if he had to lower his aspirations to the limited horizon of the world in which he lives, if all reality were merely history and culture, and man did not possess a nature destined to transcend itself in a supernatural life, then one could speak of growth, or evolution, but not development. When the State promotes, teaches, or actually imposes forms of practical atheism, it deprives its citizens of the moral and spiritual strength that is indispensable for attaining integral human development and it impedes them from moving forward with renewed dynamism as they strive to offer a more generous human response to divine love. In the context of cultural, commercial or political relations, it also sometimes happens that economically developed or emerging countries export this reductive vision of the person and his destiny to poor countries. This is the damage that “superdevelopment” causes to authentic development when it is accompanied by “moral underdevelopment”. The Church’s social doctrine holds that authentically human social relationships of friendship, solidarity and reciprocity can also be conducted within economic activity, and not only outside it or “after” it. The economic sphere is neither ethically neutral, nor inherently inhuman and opposed to society. It is part and parcel of human activity and precisely because it is human, it must be structured and governed in an ethical manner. 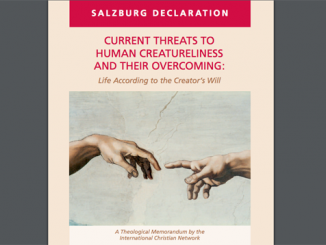 …In vitro fertilization, embryo research, the possibility of manufacturing clones and human hybrids: all this is now emerging and being promoted in today’s highly disillusioned culture, which believes it has mastered every mystery, because the origin of life is now within our grasp. Here we see the clearest expression of technology’s supremacy. In this type of culture, the conscience is simply invited to take note of technological possibilities. Yet we must not underestimate the disturbing scenarios that threaten our future, or the powerful new instruments that the “culture of death” has at its disposal. To the tragic and widespread scourge of abortion we may well have to add in the future—indeed it is already surreptiously present—the systematic eugenic programming of births. At the other end of the spectrum, a pro-euthanasia mindset is making inroads as an equally damaging assertion of control over life that under certain circumstances is deemed no longer worth living. Underlying these scenarios are cultural viewpoints that deny human dignity. These practices in turn foster a materialistic and mechanistic understanding of human life. Who could measure the negative effects of this kind of mentality for development? How can we be surprised by the indifference shown towards situations of human degradation, when such indifference extends even to our attitude towards what is and is not human? What is astonishing is the arbitrary and selective determination of what to put forward today as worthy of respect. Insignificant matters are considered shocking, yet unprecedented injustices seem to be widely tolerated. While the poor of the world continue knocking on the doors of the rich, the world of affluence runs the risk of no longer hearing those knocks, on account of a conscience that can no longer distinguish what is human. God reveals man to himself; reason and faith work hand in hand to demonstrate to us what is good, provided we want to see it; the natural law, in which creative Reason shines forth, reveals our greatness, but also our wretchedness insofar as we fail to recognize the call to moral truth.